Among the many superb dining establishments in Dubai are a host of restaurants specialising in providing diners with a memorable meat-eating experience. Quite simply, if you’re a lover of meat, you’re spoilt for choice. Steak, lamb, beef, chicken. Grilled, fried, charred or barbecued. The options are (almost) endless. As a meat eater in Dubai, one of the biggest problems you will face is establishing which places are worth a visit, and which should be given a wide berth, but fortunately for you that’s where we come in, because we have put together a comprehensive list of where you should be heading in order to feast like a Flinstone. So read on, take note and thank us later. 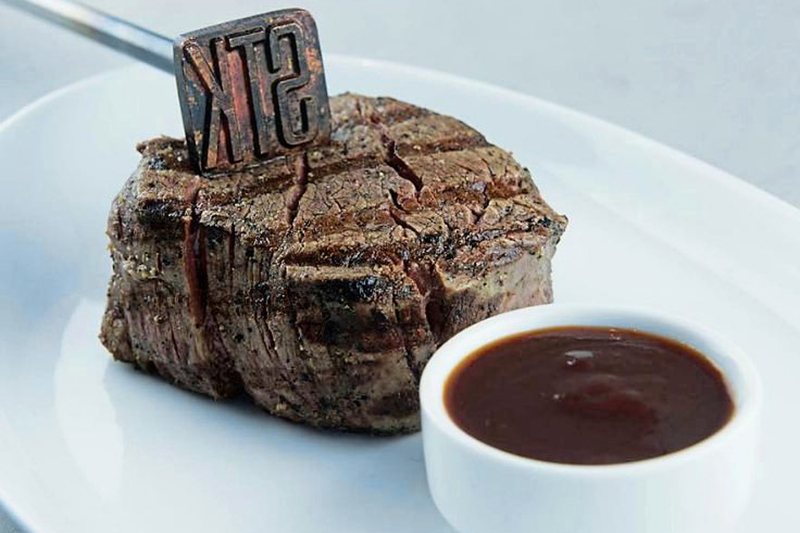 An established brand which has been shaking up the steak scene for many years in locations such as London, Miami and Ibiza, to name just a few, the popularity of STK in Dubai continues to grow at a frenetic pace. The perfect spot for foodies and party people alike, STK is the type of venue in which you can enjoy whatever kind of night you want, whether it’s simply sampling some prime beef cuts which are packed full of flavour in a slick and stylish setting, or lining your stomach while the DJ spins the tunes at the start of a big night out. When it comes to food recommendations the clue, of course, lies in the name. Classic dishes such as rack of lamb and corn fed BBQ chicken breast are available on the menu, but when you’re dining in an establishment which specialises in steak, it would be foolish to order anything else. Trust us, we’ve made that mistake. 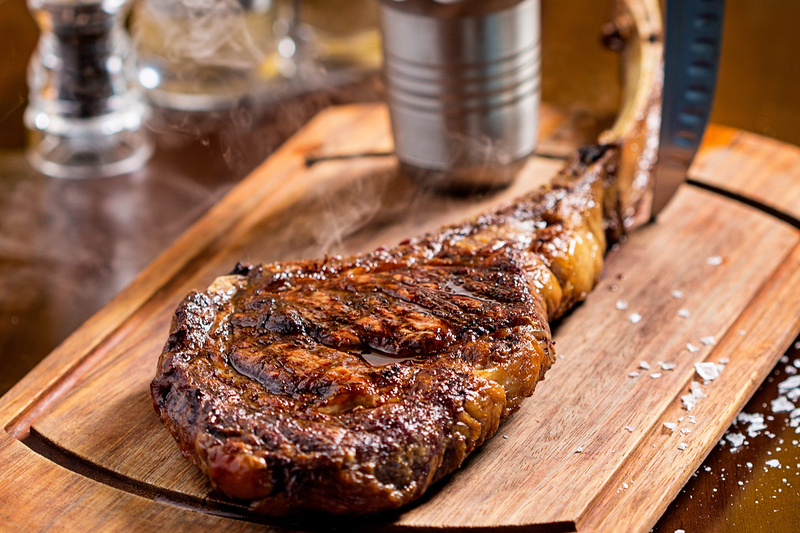 If you’re feeling particularly hungry, large prime cuts of t-bone and tomahawk are available, with unique toppings including poached lobster. The Friday brunch at STK is well worth a visit and there are deals and promotions running throughout the week. Located at the luxury Habtoor Palace, World Cut Steakhouse leaves no stone unturned as it attempts to give diners the ultimate steak-eating experience. And an experience is undoubtedly what you get. Before the meat has even been ordered you’re asked to “choose your weapon” and select from a number of different steak knives, while the restaurant boasts an unrivalled selection of condiments, including unique options such as gingerbread mustard (well, why not?). The steaks have all been imported from the US and Australia, with over ten cuts to choose from, and we can safely say you won’t be disappointed, regardless of your selection. 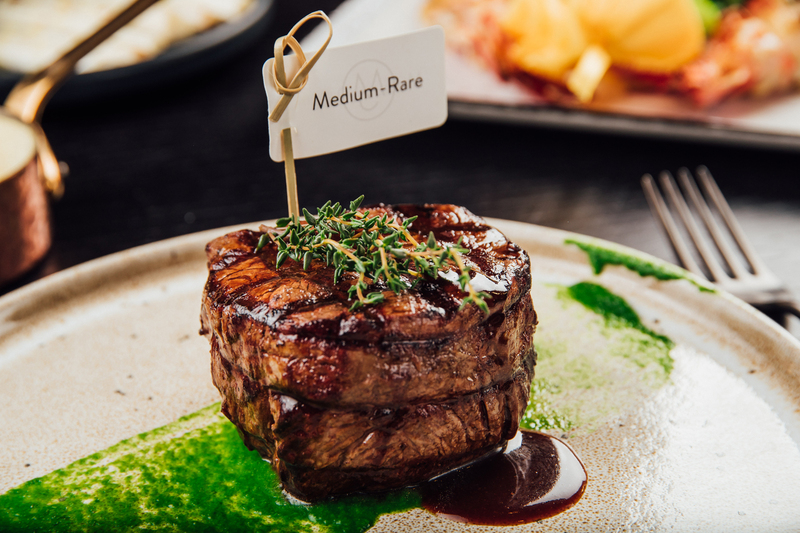 Among the options here are a wagyu fillet which is widely regarded as one of the best steaks in the world, so why not give it a bash? A cut above the others? Maybe. We’ll let you decide. Everybody loves a burger, right? And they don’t come much better than those served up at Black Tap, which has restaurants in both JBR and Jumeirah Al Naseem. The company, which started out in New York, has now spread its wings and boasts a strong presence across the UAE with locations in Kuwait, Abu Dhabi and Bahrain, as well as Dubai. Black Tap burgers are well loved for a reason and highlights on the menu include the spicy Mexican, made up of chicken, chorizo, jack cheese and chipotle mayo, as well as the Greg Norman, with wagyu beef the key ingredient. If you’re not in the mood for a burger (what’s wrong with you? ), there are plenty of other marvellous meaty options – a fried chicken platter and spicy Korean BBQ wings to name just a couple. You can also take advantage of a fine selection of hops on draught or, if it’s a school night, a calorie-packed shake which will leave you struggling to walk home. But you’ll still be glad you visited Black Tap. The Blacksmith’s custom-built smoker is fired up long before diners begin to arrive at the restaurant in order to infuse succulent cuts of meat with fantastic flavours. At The Blacksmith, you see, flavour is king. Salt, pepper, wood (and time), combined with the perfect piece of meat, are all that’s required in order for chefs to satisfy the heavy influx of diners who frequent the restaurant, located in the Wyndham Dubai Marina, on a daily basis. One quick glance at the menu suggests you’d better head elsewhere if you’re not into your meat. Smoked chilli rubbed wings and chicken tenders jump out from the starter options while the Texas brisket sandwich (including beef which has been smoked for 14 hours) and pulled lamb are undoubtedly worth checking out when it comes to the mains. A magical, meaty experience is all but guaranteed down at The Blacksmith. A meat lover’s dream, this Brazilian establishment, situated on the 35th floor of the Ramada Plaza, offers fantastic views of Dubai Marina. More importantly, though, a visit to this eaterie will allow you to feast on a wide range of beautiful barbecued meat cuts. With an all-you-can-eat menu, featuring over 20 cuts, your overall dining experience is enhanced as attentive staff fill your plate with succulent selections until you can literally take no more. There is the option to enjoy your meal in the spectacular outdoor dining area, a stunning setting, while every night of the week (apart from Sunday) a lively Latino band ensure the atmosphere, just like the food, is truly top notch. Fogueira translates as “bonfire” in Brazilian, and your night is sure to catch fire once you get stuck into their magnificent meaty cuts. 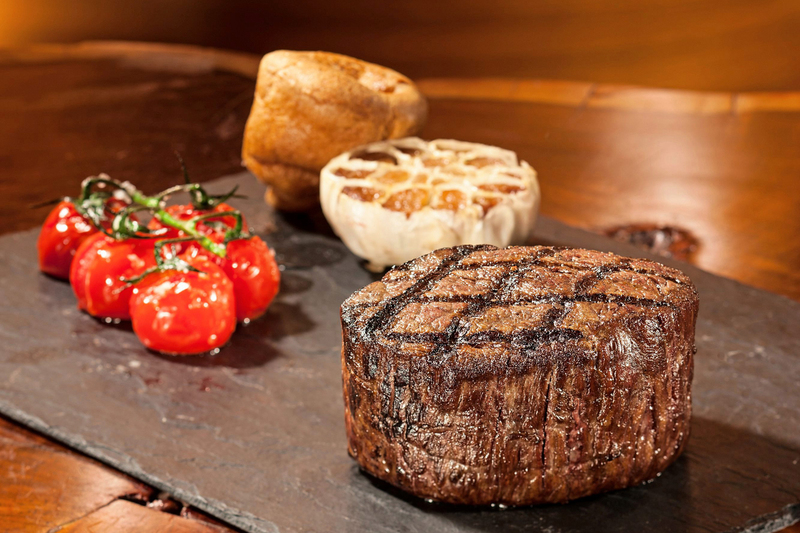 Whether you live in Dubai or you’re just here on holiday, the Seafire Steakhouse, located within Atlantis, is undoubtedly worth a visit as it serves up some of the best steaks in the city. The savoury short rib donuts, on the starter menu, are filled with beautiful braised beef and will probably be the highlight of your whole meal, but that’s not to say the main courses aren’t up to scratch. Far from it. The barbecue pulled brisket burger (48-hour cooked pulled beef brisket), immediately catches your attention, as does the Seafire short rib (served with miso sweet potato mash, if that helps?). Diners can enjoy a wide range of choices at Seafire, from the number of days the cow is grain fed to the marble score, ensuring your experience is one you’re unlikely to forget in a hurry. Much like the donuts. You don’t have to spend a fortune in order to enjoy a high-quality mighty meat feast here in Dubai, and Barbecue Delights, which has branches across the region, is one of the best low cost options. Bringing together South and central Asian culinary traditions, Barbecue Delights produce high-quality, flavoursome meaty dishes to suit all tastes. When it comes to chicken from the grill, there are an array of attractive options, including the reshmi kebab — minced chicken marinated in spices and mixed with green chillies, coriander and onion — and malai tikka, where tender tender pieces of boneless chicken are marinated in cream, milk and light spices. Simply delightful. With beef from the grill, and plenty of curry dishes, also available, this is undoubtedly a place to put on your “to visit” list if you haven’t been fortunate enough to do so already. If you like your meat, it’s a great place to eat. 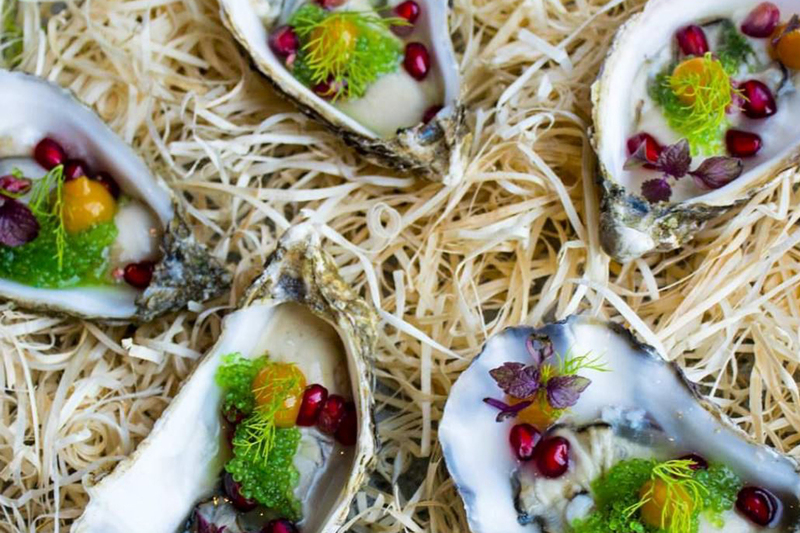 Probably best known for Salt Bae, its owner, and his unique method of covering tasty meat dishes in rock salt, but there is more to this eaterie than simply being a place to tick off for the rich and famous when they’re visiting Dubai. You will find marvellous meaty creations here in abundance, such as the Nusret spaghetti, which is steak strips seasoned with virgin olive oil and sea salt. The marinated sliced beef is equally impressive while the starter menu selections include smoked rib-eye and steak tartar. It’s difficult to order badly in here. The fact it has branches across the globe in locations such as Doha, Miami and New York suggests Nusret is much more than just a gimmick, and with an array of unique options on the menu, meat lovers are advised to head down and see what all the fuss is about. Celebrity chef Simon Rimmer’s Pier 7 establishment is well worth a visit if you want a variation in terms of the meat dishes on offer. 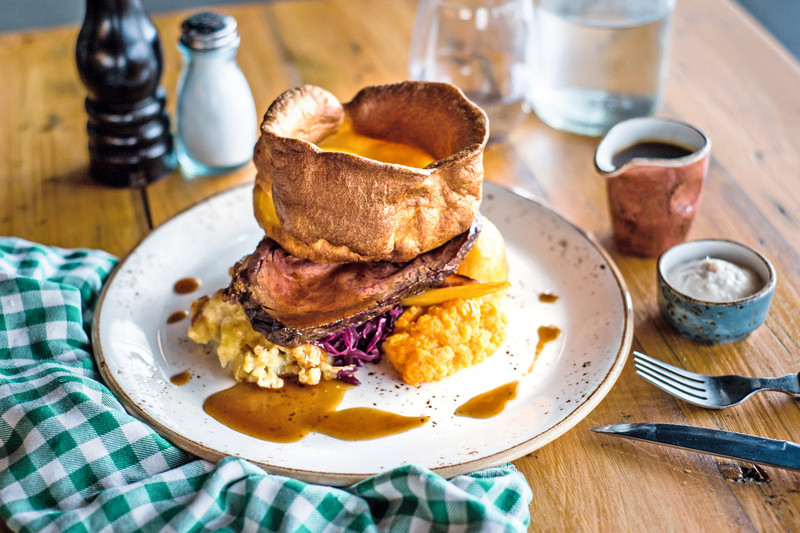 The Scene doesn’t specialise in steak, or chicken, or lamb, but you can enjoy all three, plus much more, thanks to an exciting menu which will leave you struggling to decide what to order. Burgers, pies and kievs all feature, while the lamb rump and beef cheek, although at the higher end price-wise, cannot be faulted. Of course, you can never have too much, so why not check out these meat-inspired brunches and enjoy hours of feasting? The name says it all. Meat, meat and more meat. With only premium cuts served at this South African restaurant, you’re guaranteed a fantastic food-filled afternoon while enjoying great views of Downtown Dubai. Hot starters, which include beef boerewors with African spices, are selected by the chef and brought to the table, before you indulge in the mains, with options including American prime rib-eye and a duo of chicken. Lovely. A brunch which prides itself on providing flavours from around the world, Feast is sure to satisfy those with a carnivore-like appetite. Whether it’s Indonesian beef rendang or the fail-safe British beef wellington, you won’t be disappointed. And if you really are that lazy, there is also the option to have the chefs knock you up a brilliant burger which is then delivered straight to your table. Probably worth the entry fee alone. 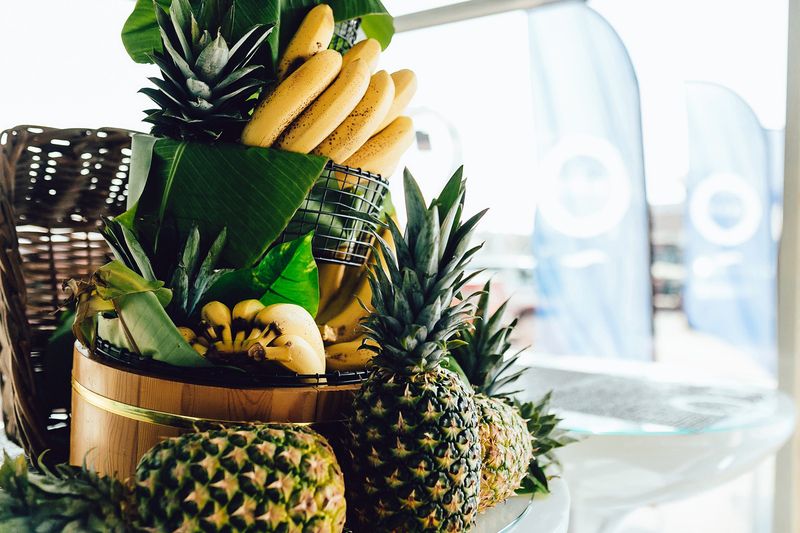 Maybe not an obvious choice, but the meat counter at Zero Gravity’s Tropical Brunch on a Friday is not to be missed. There are so many options, ranging from simple flavoured chicken fillets to cuts of lamb and superb juicy burgers. However, the real treats are less familiar delights such as Carribbean beef and kangaroo. Spicy, succulent and special. So enjoyable, particularly with the sun beating down. Go and check it out. The fact the word “monster” is included in the name pretty much says it all. Featuring four separate fillings – mac ‘n’ cheese, pulled beef, nachos with sour cream, guacamole and salsa and caramelised onions with mushroom and mustard – this is a mammoth task. And it will set you back AED150 for the privilege. This huge steak, which weighs 1200g, is listed under the “to share” section of Seafire’s menu, which probably tells you all you need to know. But the braver (greedier, some might say) souls, and those in need of a no-holds-barred meat injection, might fancy taking it on and going solo. Good luck with that. The Roost’s whole roast chicken might be tough to get through given its size, but your mission is aided by the fact the chicken is absolutely delicious, which always helps. Served in a skillet, it looks impressive, and tastes even better. For 126AED the chicken is accompanied by two sides, so polish your plate off for value. 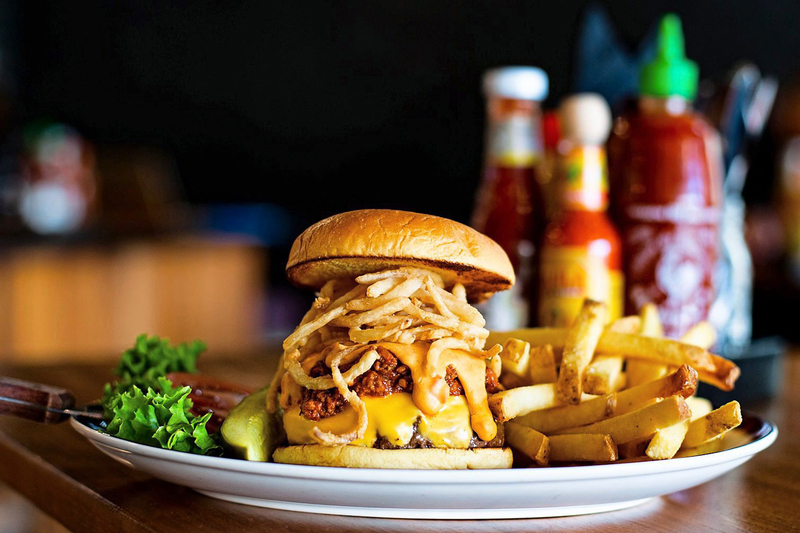 Mighty Quinn’s, which originates from New York, specialises in providing a slow-smoked barbecue experience for diners. Head here on an empty stomach and go for the mighty brontosaurus rib. They also serve breakfast, if a simple bowl of cereal doesn’t quite cut it. Beef brisket first thing? Lovely. The venue, in Towers Rotana, has launched a limited-time Wingfest, where foodies can feast on all-you-can-eat chicken wings from 12noon until 3am. Sauces include tangy sriracha, smoky BBQ and buttery classic buffalo, and the offer runs until Wednesday July 31. 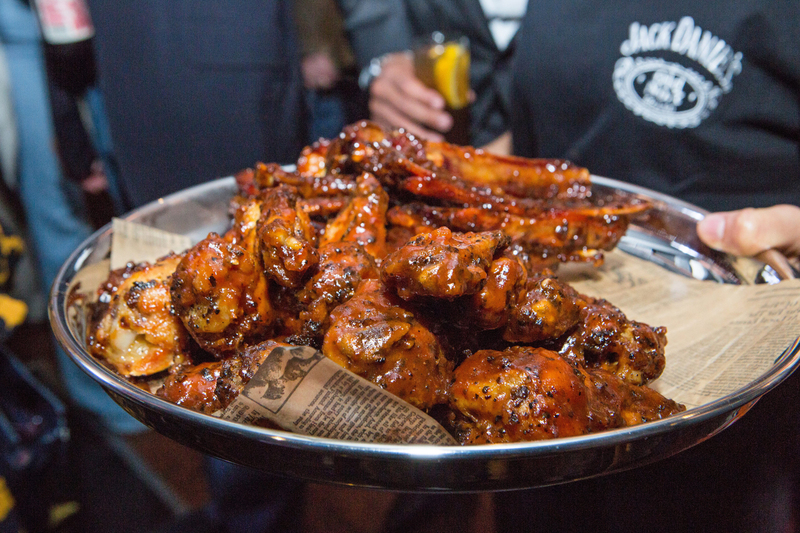 If you think you can handle the heat, there are 12 suicide inferno wings to get through in 20 minutes. For every wing you put away beyond the seventh, you’ll receive a free bottle of hops. The Initiation, at Wingsters, is as tough as it gets, with diners challenged to eat eight suicidally spicy wings in four minutes, before enduring a five-minute afterburn. The fact you’re not allowed to consume any liquid, or wipe your mouth, simply adds to the difficulty. Not much beats watching all of the sporting action unfold while chomping on wings and sipping an ice-cold beverage. Luckily, at P&B, you can now enjoy unlimited wings and drinks during all of the biggest matches, from the Premier League to Champions League, for just AED225. Once again, that clever combination of wings and hops is brought together in order to entice diners, and why not? On a Friday at Andalucia, you can enjoy an unlimited amount of both for two hours, all for AED150 per person.